We have to pass fetch xml string using one of the parameters recognized by the server otherwise exception is thrown (there is a way to disable parameters check through the registry setting DisableParameterFilter, but it’s easier without yet another undocumented setting). Since we want to disable search functionality it makes sense to re-use search parameter. Turns out, grid control in version 4 still recognises fetch xml, the challenge was to pass it. Kudos to Adi for finding a very clever workaround to inject fetch xml directly. The following code needs to be inserted anywhere in the <CRM site folder>\_controls\lookup\lookupsingle.aspx file. it good but it working in crm4 only not in crm2011. Hi Do you know of any reason this would work in my DEV environment but not my Prod ? Are there perhaps any known issues or permissions settings that must be set? Ive basically set IE to allow everything and still no luck. Thanks a lot for the post. 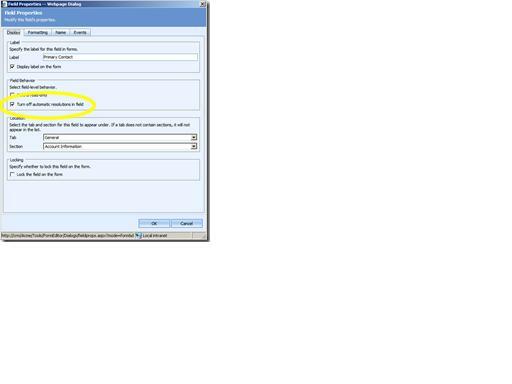 Before I implement this, I want to know if this is supported by Microsoft as it involves changes to lookupsingle.aspx. Thanks very much for the post and its working perfecly! I need to work around for another task that is user wil enter the value in lookup search box, instaead of default search it should use custom fetchxml .